History is our way of connecting with the past. At its best it can be a methodical, analytical and objective approach at uncovering forgotten periods in time, or introducing us to the completely unknown. It is of course open to interpretation, and evaluating and re evaluating events can introduce new ways of looking at the past. One thing that does remain important are 'facts' something that is born out of truth, and remains the building blocks for all other elements to be added. I recently acquired a rather intriguing gift pack that contained some interesting text. 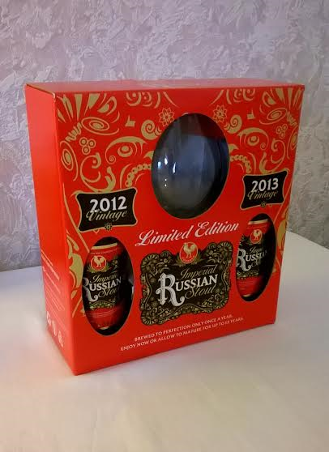 The stylish pack is produced by Belukus Marketing Inc. importers of fine ales to the American market and comprised of two Imperial Russian Stouts, one from the 2012 vintage and the other 2013, with a branded goblet glass sitting between the two bottles. Whilst in itself it seems innocuous enough it is an interesting interplay of words, which, basically, are trying to re jig history. 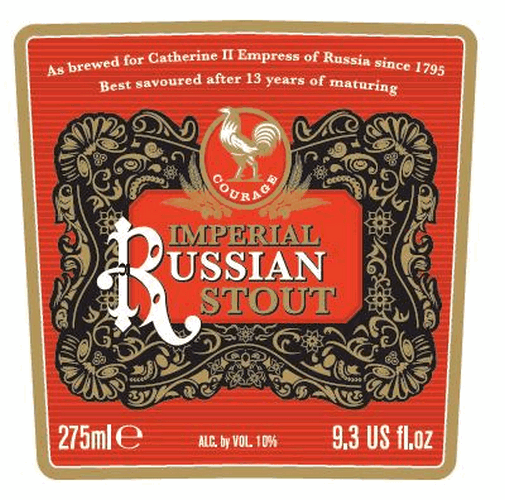 As those who have an interest in the style will tell you the original brewery who created the product that was exported to Russia was not John Courage, but Barclay Perkins. Robert Barclay (A nephew of David Barclay of the American Quaker banking family) and John Perkins (the head brewer during the time of its previous owner Henry Thrale) came together in partnership in 1781. The label today carries the wording 'since 1795' but the first mention of the Stout (which was then called Porter) made an appearance in Mr. Farington's diary dated 20th August 1796. He states "I drank some Porter Mr. Lindoe had from Thrale's Brewhouse. 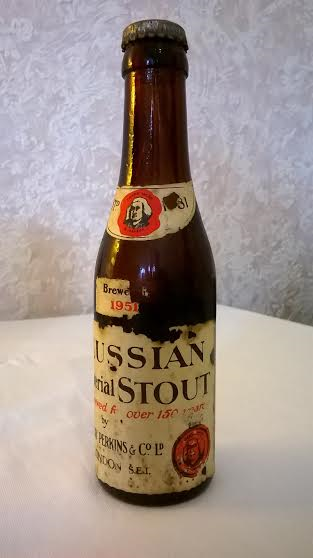 He said it was specially brewed for the Empress of Russia and would keep seven years." As porter and stouts could only be brewed in the winter months at the time presumably the '1795' refers to the fact that it was brewed the previous season. the home of Barclay Perkins. 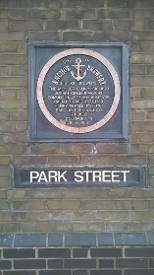 Both Breweries, with Barclay Perkins situated at Park Street, Southwark, and John Courage further up river at Horsleydown just beyond Tower Bridge, did share one thing in common, both were called the Anchor Breweries due to there proximity to the river Thames - but that is where the similarity ended. 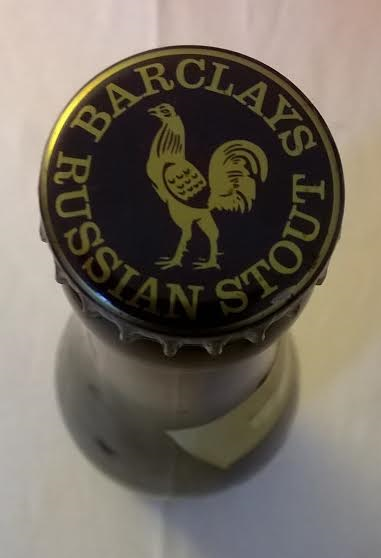 They both remained remained staunchly independent until the companies finally merged in 1955, but for the first 160 years the Imperial Russian Stout sold today was solely a Barclay Perkins product. 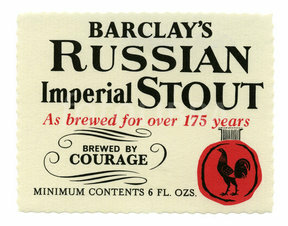 Courage did produce an Imperial Stout in the 20th Century as many brewers imitated successful styles, but it is not the one sold under their name today that is the Barclay product. The 1787 referred to on the gift pack is purely the foundation date of the Courage brewery at Horsleydown. The brand was slowly assimilated into the Courage fold over a number of years with both labels and crown caps reflecting the union until eventually it only carried the Courage trademark. The beer itself is iconic, and a word which is often overplayed but justified here 'unique' due to its origin. It is also an important product for the brewing world in general as it holds both a gravitas, and mystique that elevates it to the level of fine wine with its keeping qualities and acts as a qualitative ambassador for the industry. Not that this status was always appreciated in recent years as it was pushed from pillar to post as Courage closed various brewing sites, and the brand fell into obscurity. Between 1993 (last brewed at John Smiths at Tadcaster) and 2011 ( by Wells & Youngs in Bedford) the beer bacame largely a forgotten part of our brewing heritage. Ironically, it was the interest of the American craft beer sector in the 'Imperial Stout' style that reignited interest and its position in the hierarchy of Imperial stouts re established. So what of the text on the gift pack how important it it? In my opinion it matters a great deal. One of the dangers of the modern marketing approach is the need to re imagine events for the sake of of a more comfortable continuity. What this does in effect is remove the truth from the equation, a form of dumbing down on reality. The brand of course does have a lineage and for over a century and a half it was not a Courage product. There is nothing wrong in admitting to the fact (for that is what it is) and most would admire the honesty, and are more that capable of assimilating the information. proudly brewed for 150 years, and of the 1951 vintage. the Courage Cockerel in the centre. The merging of the brand continues, as the Barclay's heritage fades. The re introduced product from the 2011 vintage - the Empress choice.